Julie is the wife of ShopOnMain’s CEO, Joe. She and Joe live in a rural area of Kentucky, and one day she was in a neighboring town to do some shopping. In one particular store, the owner told Julie she’d recently been in New Orleans on vacation. While she was there, she ate in a restaurant that served the most amazing dip as an appetizer. She said it was so good she asked what was in it. The waitress told her it was made with a local product called Captain Rodney’s Boucan Glaze. This dip was so amazing, the Kentucky store owner contacted Captain Rodney’s and ordered it for her store. After hearing this story Julie just had to try it. She and Joe also fell in love with the sauce, and they’ve been buying it ever since. That’s the magic of product stories. They don’t have to be elaborate, or long or have a ton of details. But if there is anything you find special, noteworthy or interesting about a product your customers will think so too. How is this product made? Is there some aspect of making it that would seem interesting to shoppers? Note – this doesn’t have to be a unique feature, just one that other products don’t talk about. More on that below. What experiences have you, your staff, or your customers had with this product? In the early 1900’s, Schlitz Beer was at the bottom of the heap of beer manufacturers. They hired Claude Hopkins (a legend in advertising even then) to turn things around. 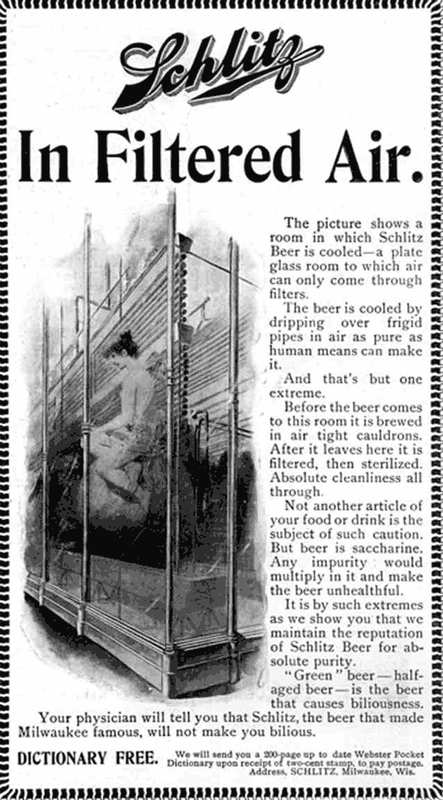 At the time, all beer companies were basing their advertising on how “pure” their beer was. Hopkins took a tour of the brewery and discovered the elaborate process involved in purifying beer. The brewery manager told him that everyone brewed beer this way, but that didn’t matter. No other beer company had told the story of the process to consumers. So Hopkins created a series of ads that simply detailed the process – told the story of HOW Schlitz made it’s beer pure – and ran them. Overnight, Schlitz became the #1 selling beer in America. So why didn’t the other beer companies tell the story, too? Show that they did the exact same thing as Schlitz? Because it was too late. Schlitz had claimed this story in the public’s mind and anyone else trying to tell it sounded like copycats. The point is, a story doesn’t have to be unique to your product. It only has to be something that hasn’t been told by another product – or at least not told in such a way that it caught on. Which leaves you a lot of room to work with. Where Do You Tell These Stories? And anywhere else you can possibly think of! Stories are how humans connect. The world is starving for stories and connection. If you can begin to tell stories about your business and your products – one short one a day, day in and day out – you’ll build a business that people can’t resist. One that they’ll flock to, support and defend. One they’ll become evangelists for. In other words, stories are the key to your success in the Internet Age.